Piping systems, such as those installed in refineries, are transmitters of high-pressure fluids or gases at high temperatures, and failure of such systems may cause catastrophic damage. Advanced design codes have been developed to provide safety instructions for designers. Piping systems are initially installed at reference temperature. At working conditions, under elevated temperatures, the end expansion and contraction forces and bending moments are created. The resulting thermal expansions, due to the imposed constraints, may produce large stresses which, if not properly taken care of, may cause failure. This chapter presents a simple method of analysis of piping systems. 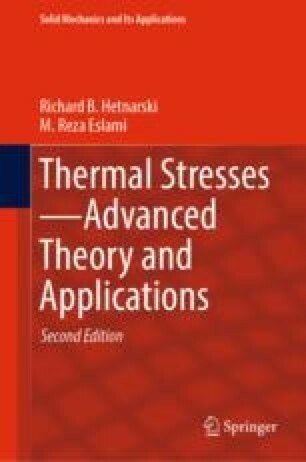 The main scope of the chapter is to provide an analytical method to calculate the end expansion and contraction forces and bending moments. In a number of examples, it is shown how the end forces and moments may be made smaller. The chapter then continues to present the stiffness method of piping system. While the method of elastic center is restricted to only one branch of piping system and the pipe elements must be parallel to the coordinate axes, the stiffness method has none of these limitations and handles a piping system with any arbitrary number of branches and the pipe elements may have any arbitrary directions and not necessarily parallel to the coordinate axes.